All dressed up for Valentine’s Day and filled with delicious fresh raspberries and whipped cream. We dipped these cute little cream puffs in chocolate ganache and topped with fun sprinkles from @fancysprinkles. 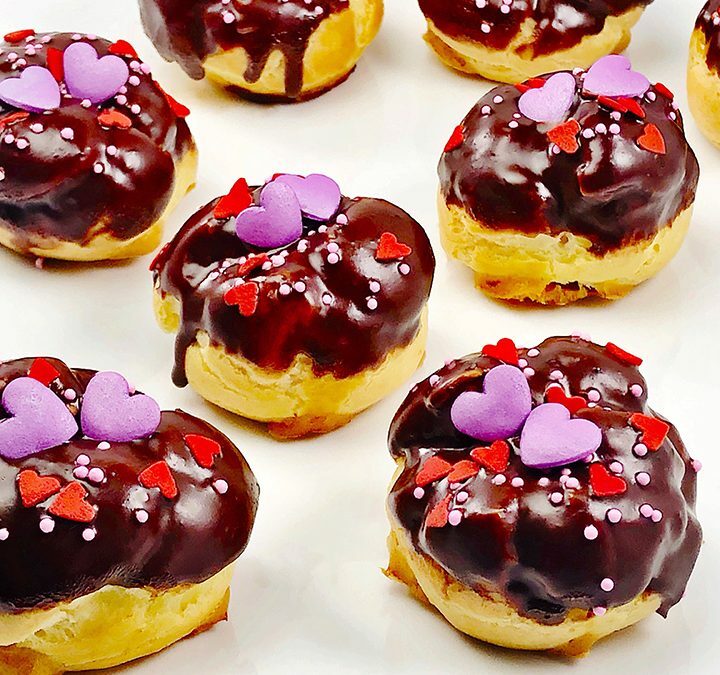 Perfect for the day of love, cream puffs are easy to make using a simple Pâte à Choux dough then baked to crisp, puffy perfection. Preheat oven to 375˚F. Line two baking sheets with parchment paper. Over medium-high heat in a medium saucepan, add the butter, sugar, salt, and 1 cup water. Bring to a boil and stir in the flour with a wooden spoon. Continue to stir until a film forms on the bottom of the pan. Remove from heat and transfer contents to a bowl to cool slightly about 3 minutes. Add 4 of the eggs, one at a time, stirring vigorously to entirely incorporate egg after each addition. For the egg wash, whisk together the remaining egg with 1 tablespoon water; Set aside. Transfer the dough to a large pastry bag fitted with a large plain tip. Pipe twelve 1-1/2 inch rounds onto each prepared pan. Gently smooth the pointed peaks with a moistened finger, rounding tops to ensure even rising. Brush tops with reserved egg wash. Bake until puffs rise and are golden brown for 30 minutes. While baking, do not open the oven door. Remove from the oven and cool on sheets on wire racks. To make the Raspberry Whipped Cream– Using a hand mixer, whip the cream until soft peaks. Combine the raspberry with whipped cream and transfer to a pastry bag fitted with a small plain round tip. Insert the tip into the bottom of each pastry, and pipe to fill with pastry cream. To make the Ganache– Place the chocolate in a medium bowl. Heat the whipped cream over medium heat until small bubble form around the edges of the pan. Pour the cream over the chocolate and stir until the chocolate is melted. Dip the tops in the ganache, let the excess drip off and place them on parchment. Decorate with the Valentine sprinkles, allow the chocolate to set and serve. Makes 24 Cream Puffs.